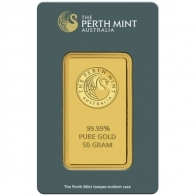 The Perth Mint issue a gold bullion bar in a range of sizes, from 1 Ounce to 10 Ounce, including 50 gram and 100 gram sizes. All Perth Mint gold bars feature the Perth Mint logo with a Swan in the center at the top of the bar. 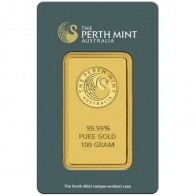 Perth Mint gold bars have a minimum fineness of 99.99%. The Perth Mint also produce a range of highly popular coins, including the Kangaroo coin series, which is available in gold, silver and platinum, and the Koala and Kookaburra series, which are available in silver. Perth Mint Bullion may be purchased using Bitcoin, other cryptocurrencies, and all major currencies. Perth gold bars may be ordered for delivery or for VAT-free storage in Switzerland.